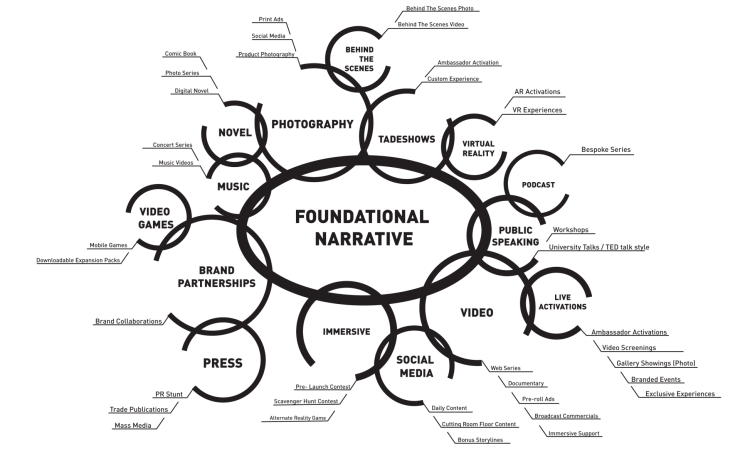 Our creative and strategy is crafted simultaneously and woven together from the start of every activation. We focus our creative and strategical energy exclusively implementing campaigns that take audiences on story driven journeys (often across platforms) that immerse and engage. At Guild26 we only collaborate with long term companies as partners who want to push the limits of what’s possible in advertising Brand Storytelling. Immersive storytelling invites the viewer to take part in a story and participate in the outcome by losing themselves in the storyline. When the audience forgets that they’re an audience… Imagine the possibilities. Transmedia tells a story across multiple platforms, always pushing viewership and engagement toward a single core message and taking the audience on an emotional journey. Transmedia Moves away from purely consumption to active engagement and collaboration with it’s viewers. Experiential marketing connects with consumers on a personal level by bringing a story to life and engaging with them in the real world. Even with technology connecting us every day, there’s still something special about interacting with your customers face to face. Experiential marketing connects with consumers on a personal level by bringing a story to life and engaging with them in the real world. Even with technology connecting us every day, there’s still something special about interacting with your customers face to face.